I’m deep in the midst of a community-wide Scavenger Hunt, one I am largely responsible for creating, implementing, monitoring, and critiquing, in case we do this insanity again next year. This is a charitable event. We charge a cool ten bucks for each participant so that we may give it all to an annual prairie event called DUCK Week. Originated at the high school, the monies go toward needing folks, mainly those with horrendous illnesses and a need for optimism. This year the recipients are the cutest three boys illness was ever cruel enough to afflict. Thus, our Scavenger Hunt, affectionately known as MASHPEAS: the Most Awesome Scavenger Hunt Piedmont Ever Attempted (Seriously). One of the tasks, one I instigated, is to dress a duck and snap the photo for others to ogle. With this task in mind, I recruited my Bubs to help me round up Brown Duck, the beloved sole survivor of one coyote attack, one frozen night, and one overly zealous Moose Dog who summarily took out all of Brown Duck’s tribe with eight gigantic and surprisingly quick paw slaps. Now, Brown Duck has survived a half-hour onslaught of my yelling, “Corner him! Corner him!” and my maneuvering around a John Deere that Brown Duck wisely, infuriatingly, ducked — pun intended — behind. Of course, once he was running again, it took another ten minutes to build up the requisite frustration to make a run at him — fear be danged — and pin him to the ground like I was going to eat him. All so I could put a cobbled fur wrap around his neck and take a picture for the Scavenger Hunt feed. Ten points?? Are you kidding? 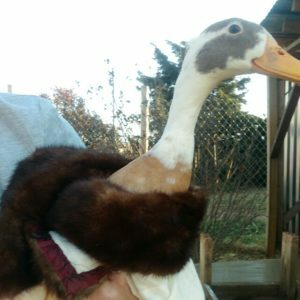 We traumatized already stricken Brown Duck for ten tiny, miniscule points?? Who determined that this kind of battle was worthy of ten measly points? I’m gonna write a letter, I’m gonna…oh, yeah. That was me. I guess I’m grateful for my own reptilian brain.